Stuffing From A Bag: Can You Improve It? After making my own stuffing from scratch, I realized that my supermarket sells stuffing in bags and boxes. I stood in the stuffing aisle and began my incredibly scientific research of picking up and putting down boxes. Hmmmm. What did I think? The sodium amounts per serving are OUT OF CONTROL. The norm was 500 mg per serving. How am I going to taste the turkey with all that salt? The one low sodium version had MSG and wasn't much lower in sodium. The boxes and bags were inexpensive. I have no doubt that my homemade version is much more costly. I bought the one that looked the best – Arnold Premium Stuffing Seasoned (400 mg sodium per serving) and decided that I could maybe improve it. In a shocker, the package wanted me to add 8 ounces of butter to the mix. I use about 4 ounces of olive oil in my stuffing. I added sautéed onions and celery (and as you can see some parsley) to try to make it work and I cut the butter in half. I thought this was OKAY. My Australian husband pronounced it inedible and asked me why I would serve something that tasted like soggy bread and call it stuffing. He went on and on about real food and how Americans are without a clue. I looked in Whole Foods and their packaged stuffing averaged 390 mg sodium per serving (not much better). I say stick with homemade stuffing like my Vegan Stuffing. Have you worked with store bought stuffing? How do you make it pop? Have to admit this doesn't look like what I know as stuffing at all - although I loved that you added the celery and onions to improve it. I love your site and am always encouraged to choose a healthier option/make it myself. I use the Pepperidge Farm stuffing, and I'll admit I never looked at the label. I use only a fraction of the butter and add some of turkey juices and some of my homemade gravy to it. I make my own bread crumbs, but I've never tried stuffing from scratch. Every year we try doing something different, last year we made biscuits from scratch instead of the Pillsbury ones as we decided to try to avoid trans fats. Maybe this year we'll try home made stuffing. 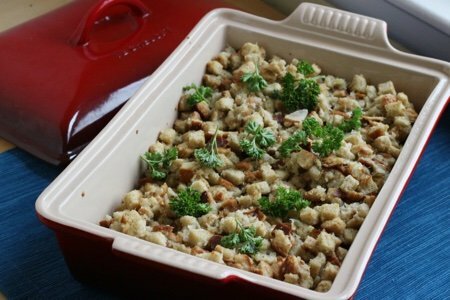 Has anyone tried the Trader Joe's stuffing? They have a box kind like what you are describing but they also have an already made take-home meal version. It sounds delicious from the advertisement? Pepperidge Farm Stuffing Mix + sautee 1/2 lb Bob Evans sausage till crumbly and brown, add chopped onions and celery, sautee till tender. Season with poultry seasoning, salt/pepper to taste. Blend together with stuffing mix and low sodium chicken broth till all breading is moistened very well. Place in a casserole dish and bake till set and nicely browned on top. Serve hot. We buy Pepperidge Farm - one bag a year for Thanksgiving. My spouse likes it made with homemade chicken stock topped with his turkey gravy. Other than a gluten free alternative, I haven't tried to sub this primarily because we would have to acquire/make some sort of bread product to produce it and we simply don't do that much. I make my stuffing with corn bread & wheat bread. Never out a box because and cheaper. If you want to make it quick use Jiffy corn bread mix a box is $.25. I was planning on looking at Whole foods after reading every label at a few supermarkets between Pepperage Farm, Stove Top etc. The ALL had High Fructose Corn Syrup and MSG! Does Whole foods not have a more natural option???! I think I will make my own with either store bought fresh cut up ww bread or cut up my own. I will probably look up a healthy recipe on-line. I always make my own....day old bread, onions, celery, sage, S&P, a little olive oil and turkey stock. Very easy and fairly healthy. To Sharon - may your holiday preparations include an attitude adjustment and a kindness of spirit. I buy the bag of dried cubed bread in Hy-Vee Food store bakery department. Nothing added, just the bread. Then I add my own seasonings and etc. That way I don't have to cube and dry the bread. I have nothing to add to the discussion about stuffing mix but I feel compelled to respond to Sharon's comments. I really don't understand why you were so offended by her husband's complaint and went on such a rant! I found his comment amusing and was not offended in the least. Just hit unsubscribe and be done already. I thought your husbands comment was very funny and obviously said tongue in cheek. Some people just don't have a sense of humor. There was nothing offensive about it. Buh bye Sharon.... I use pepperidge farm, add craisins, butter, ff chicken stock, onions and celery. It's fabulous. It's once a year, so the butter and sodium splurge isn't going to concern me. Thanks for writing great columns! never have to buy stuffing mix I use torn cornbread. My short cut is a roll of loose turkey breakfast sausage ( most of spices are in it). I make the exact same stuffing as Karyn Davies does and it is wonderful. Last year I added chopped pecans to it. Bah Humbug Sharon - - shame on you! Miss Holly, Cornbread, hmmm, that sounds interesting and I bet delicious!